King Jaehaerys once told me that madness and greatness are two sides of the same coin. Every time a new Targaryen is born, he said, the gods toss the coin in the air and the world holds its breath to see how it will land. This chocolate surprise was the final course in my Season 7 Game of Thrones party, in which I themed each of the courses around a family of Westeros. The Targaryen family's disposition to mad rulers like the Mad King and legendary monarchs like Aegon the Conqueror is an interesting part of Westerosi lore. While the stories and the quote above make it out to be an either/or phenomenon, I wonder if some of the Targaryens are a little of both? Either way, I wanted to represent this dichotomy in the Targaryen course. I went with chocolate truffles, which are easy to make, and more importantly, easy to make look the same from the outside while secretly containing a flavor on the inside. For the "greatness" of the Targaryens, I went with lavender - a soothing flavor, as well as the hereditary Targaryen eye color. For the "madness" of the Targaryens, I went with cayenne pepper and cinnamon - a surprising but still appetizing flavor, evocative of the "fire" portion of the "fire and blood" Targaryen words. I served the chocolates in tiny gift boxes decorated with the Targaryen emblem, and a miniature scroll with a quote about the Targaryens. Makes 8 lavender chocolates and 8 chili chocolates. Heat 1/3 cup heavy cream in a small sauce pan until simmering. Stir in the dried lavender. Turn off the heat and let steep for 5-10 minutes. Strain, reserving the cream and discarding the lavender. Nest a small heat-proof bowl or pyrex measuring cup inside a saucepan filled with a couple inches of water. Combine 1 tbsp butter, the lavender-infused cream and 3 oz chocolate chips in the bowl. Bring the water in the saucepan to a boil, stirring the chocolate constantly until melted through. Cover with plastic wrap and refrigerate until mostly solid - around 2 hours. Repeat step 2 with the remaining butter, cream and chocolate. Stir in the cinnamon and cayenne powder, tasting for spiciness. Refrigerate for at least a half hour, or until ready to serve. 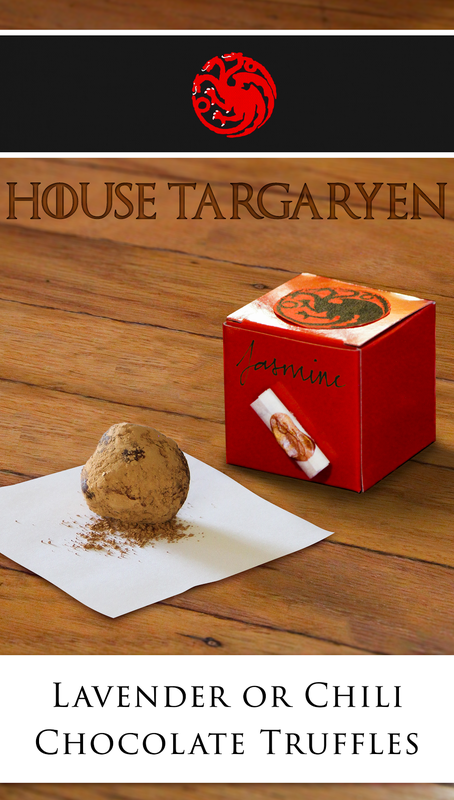 For the best dramatic effect, serve in Targaryen Truffle Boxes (instructions below). These boxes were a perfect fit for truffles, but this craft is a quick, inexpensive and effective way to make favor boxes for other themed Game of Thrones parties. While neither weddings nor childbirth are all that romantic in George R.R. Martin's universe, I suppose they could be cute at a Game of Thrones wedding or a Game of Thrones baby shower. I might keep my own Thrones parties limited to celebrations of birthdays or television episodes. The tiny scroll is my favorite part of these boxes. I think I will incorporate more tiny scrolls in my table settings. Cut each sheet of calligraphy paper into sixths. In an appropriately medieval script, write the following quote: "King Jaehaerys once told me that madness and greatness are two sides of the same coin. Every time a new Targaryen is born, he said, the gods toss the coin in the air and the world holds its breath to see how it will land." Preheat the glue gun and load with the sealing wax. Roll a script into a tight scroll. Dollop on a drop of sealing wax slightly larger than a pea. Press with the seal, hold for 5-10 seconds, then remove the seal carefully. Repeat for the remaining scripts. Download the Targaryen three-headed dragon sigil (for example, from here) and re-size to be 1.5 inches in diameter. Print 12 in white and 12 in red and use scissors to cut into circles. Fold the 12 box flats into gift boxes. Create an X-shape at the back of each white Targaryen circle with the double-sided tape. Place a white circle on the bottom of the inside of each box to hide the folds. Create an X-shape with double-sided tape on the back of each of the red Targaryen circles. Attach to the center of the box lid. Use scissors to cut a small sliver of double-sided tape. Affix to the reverse side of the sealed scrolls then press onto the front face of the box. Label each box with a guest's name. Randomly distribute the chocolate truffles among the boxes. Store the boxes in the fridge until ready to serve. Use as a table setting place marker. 'Thronesgiving,' a Fandom Foodies month-long celebration of Game of Thrones-inspired cooking hosted by The Gluttonous Geek. Check it out for more great recipe ideas!